We at Deep Roots Garden Center are very happy to say that for Christmas 2014 we will be continuing the long standing tradition of selling “The Best Christmas Trees in the South Bay” from our 207 N. Sepulveda Blvd. Manhattan Beach location. This tradition started with Bob’s Nursery and, like Bob, Deep Roots’ owner Jon Bell is dedicated to providing the highest quality of trees possible. We are rooted in the local community and we want to show our commitment to family traditions. 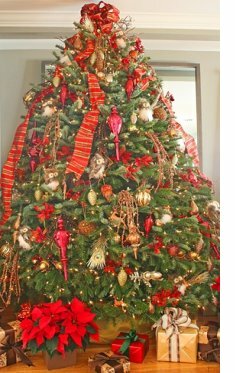 The magical quality of Christmas starts with the tree and we are dedicated to providing the "Best Trees in the South Bay" this year and in the future. We CARE about our trees and are proud to offer our community our tree service. Our first shipment of trees will arrive on November 22nd and will be ready for purchase on November 23rd. A full selection of trees will be available a couple of days after that. Why worry about the quality of your Christmas tree? A quality Christmas tree makes the difference between having a standard holiday and one that is truly special. Our trees last longer than other trees, therefore, they can be set up and decorated a week to ten days earlier than anyone else’s tree. Our trees look better, smell better and retain the gloss of a healthy tree much longer than standard trees. They drop fewer needles and are easier to remove without a lot of mess once the holidays are over. Buying your Christmas tree from us means that you do not have to struggle through a commercial tree lot looking at sad, dried up trees whose branches have been imprisoned in plastic or string. Our trees are freshly cut and put in water the minute they arrive on our lot and their branches are free to hang or bounce or do whatever Christmas tree branches do. We water them daily and keep them moist and in an environment of high humidity. Our experienced team of tree lot workers and delivery guys come back year after year to work here and can be trusted to load your tree expertly and quickly. For a service fee our drivers will deliver and set up your tree wherever you wish and make sure that it is positioned correctly and securely. How to buy your tree: Please come in to Deep Roots to pick out your tree. We cannot do this for you over the phone. Upon arrival at Deep Roots tree lot our helpful crew will assist you in finding the perfect tree for your home. We will pull out every last tree for you to look at until you are satisfied. We will honor the Old Christmas Tree Stand exchange program or sell you a new one that can be exchanged next year and in years to come*. 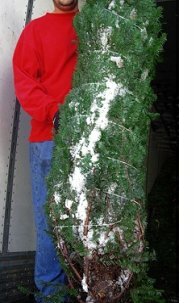 We will then either load the tree onto your vehicle or deliver it to your home and set it up for you. Delivery fees start at $15 for Manhattan Beach, Hermosa Beach, El Segundo and North Redondo. We will make it possible for you to have a tree delivered and set up in your home without you ever having to touch it. We will save you the agony of domestic disputes and potential divorce. You and your spouse can look on and relax with a glass of eggnog while the hard work is done for you. With a Deep Roots tree you can look forward to a trouble-free start to the Holiday Season. Our main grower is Windy Acres, a true Mom and Pop tree farm in in North Plains,Oregon. The farm is in the perfect location for growing trees and the owners, the Zimmerman family, manicures every tree by hand, a time consuming task performed with an eye towards detail. Dan, Darcy and Hunter Zimmerman take tremendous pride in hand pruning and shaping the trees, giving each the attention it needs to be the best specimen it can possibly be. Each tree is harvested by hand and then immediately loaded onto insulated trucks and shipped directly to our doorstep. They have a two day trip from Oregon and many years we have received them with snow still on them! (See photo above left). This year they will start arriving the Saturday before Thanksgiving and we will have a full selection of trees for purchase a couple of days after that. It is worthwhile buying your trees early as demand is high. Nordman fir tree. (Photo left) The Nordman Firs are deep green in color, have soft foliage and are known for their symmetry. They have an attractive natural sheen and the undersides of the needles are silver. More than anything else they resist needle drop and they have a natural even shape, perfect for hanging your treasured family decorations. At the top they have an upright finial for receiving your prized angel or star. Supply for this tree is far exceeding supply and numbers are limited this year. Please come in early if you want the best. We will also have the classic family favorite Noble fir trees (photo center left) from 2ft tall all the way to 13ft tall. Our selection of the light feathery Douglas firs (photo below left) will be limited to 6-7ft. trees and 7-8ft trees. Similarly we will have a limited selection of Grand Fir trees and Turkish Fir trees. 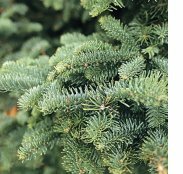 With their dark green color and shiny appearance, Grand Fir needles have a silvery-blue underside that reflects Christmas tree lights for a beautiful effect. The needles are arranged in a flat array on the twigs in a way that gives a very graceful appearance to the tree. 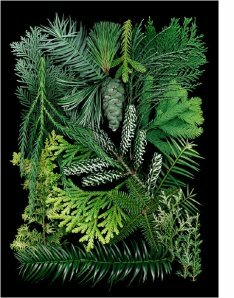 It has a pleasant citrus-like evergreen aroma and is, by far, the most fragrant of Christmas trees. Crush just a few needles between your fingers to get a sample of that aroma. They are manicured to be extremely symmetrical. We offer a fire retarding service. This is required for trees that are going into a public space or a business. Also available at Deep Roots will be a large selection of wreaths, garland, holly, Holiday greens, and garden related gift items. 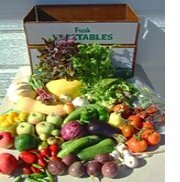 We are an established drop off point for Community Supported Agriculture organic vegetable boxes. The boxes are dropped off at our store at around 2pm on Wednesdays. We store them in our large flower cooler UNTIL CLOSING TIME ON THURSDAY. This project has been gaining in popularity among our customers who order a box every week, every two weeks, every month or simply when they feel like one. This summer we have had a regular supply of summer squashes, kale, cherry tomatoes, and more recently, butternut squash, pomegranates, peppers and pumpkins. Why not come in to the store and order a box? Or call us on 310-376-0567 and order one. At $22 for a regular box, and $17 for a mini-box it is great value for money. MUST be made by the previous Monday. The Thanksgiving Feast is a time for all the family to unite around a table groaning with good things to eat and drink... You have brought out the best china and your crystal wine glasses and what better way of completing the scene than a stunning floral centerpiece? Call our talented team of floral designers and we will custom create a beautiful and dramatic floral arrangement to your specifications. Call 310.379.3634 today and place your order for Thanksgiving, Hanukah, and/or Christmas! FALL IS THE PERFECT TIME FOR PLANTING. The generally cooler weather and overcast days provide ideal conditions for planting flowers, vegetables, shrubs and trees. The ground is still warm enough to receive and protect the roots and the transplants will suffer less stress from heat and water loss. Don’t wait for warm sunny days to work in your garden! Cool and overcast is perfect planting weather. plants set out in spring they bloom over a longer period. So prepare your planting beds, and make a shopping list. If you are sowing seed of plants such as forget-me-nots, nasturtiums or sweet peas directly in garden beds, do it right away. The seeds will use the heat and rainfall of autumn to germinate and seedlings will come along just as the temperatures begin to cool. 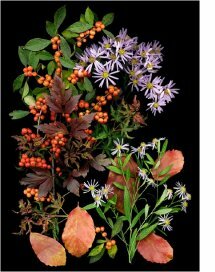 Growth may slow down as the weather gets cooler but once the days start getting noticeably longer in January the plants will grow quickly and start to bloom. Certain flowers thrive in cool weather. Plant fall annuals such as pansies, violas, primrose, poppies, snapdragons, and calendula so they will be in full fall and winter bloom. Plant some red or white cyclamen now so that they will be in full bloom by Christmas. vegetables are heavy feeders and take a lot of nourishment from the soil. We recommend Dr. Earth’s range of organic fertilizers or Gro-Power humus-based fertilizer and soil conditioner. The crème de la crème of soil conditioners is worm castings. Although this product is fairly expensive you will certainly notice the difference in the health and growth of your plants if you add it to the soil before planting, or top dress the soil each winter. Winter Vegetable Garden: You can enjoy fresh vegetables even during winter months by planting or sowing hearty cool-season vegetables including beets, broccoli, Brussels sprouts, cabbage, celery, carrots, chard, cauliflower, collards, all types of kale, lettuce, onions, spinach, turnips and rutabaga. Also plant fall herbs such as arugula, parsley, cilantro, oregano, and garlic. Plant Trees Now: Fall is the ideal time to plant trees. Our fall climate, with cool nights, mild days and moderate rainfall, gives trees a strong beginning that will serve them well when growing season begins in spring. Just about every tree type can benefit when planted in fall. The key to success is to select a planting location that is best suited for the tree type. Take into account the tree's rate of growth, root configuration, leaf type (evergreen or deciduous), tree shape and ultimate height at maturity. Make sure the site you select has enough sun. Other issues: is the selected location on a slope where watering may be difficult? Is it near a walkway or patio where in a few years roots may cause a problem? Will the tree at maturity be too big for the site? Better to answer these questions now or you may find yourself trying to extract a tree and its roots when it outgrows its location. Dormant Oil Spray for Fruit Trees: Dormant oils are horticultural oils used to control overwintering insects, such as aphids and mites that live in the bark of fruit trees. They are applied by pump sprayers or compressed air sprayers, usually after pruning in late winter to early spring. Dormant oil sprays treat specific problems and aren't all-purpose insecticides. Pests should be properly identified to make sure a spraying is warranted. the First of the year and Valentine's Day are the best times to use dormant sprays. HAPPY THANKSGIVING from all of us at DEEP ROOTS!